Beatrix Potter and Arthur Ransome wrote stories and created characters that have become part of the culture of this part of the lakes. Tales of adventures on sunny days, of breezy picnics by the lake, friendships and laughter. But some stories are much much older, these are stories of love and loss of violent actions with fatal consequence of madness despair and death, these stories ,centuries old , have been passed from generation to generation and have been around so long they are now part of the soil, the water the rocks and the air. At this time of year these stories seem somehow closer to the surface. Maybe it’s the cold still autumn mornings when the mist hangs low over the lake, deadening the background noise, allowing disembodied voices animal and human to reach out through the enveloping grey. Maybe it was the earth tremor last night; that noise and the shaking woke me suddenly with a bright blinding light and a searing pain down my spine and I have had the mother of all headaches ever since. And this is how I start my normal daily commute into work as a countryside Ranger on my trusty iron horse, a journey I’ve made a thousand times before, but this morning it feels somehow different, otherworldly, I have a sick feeling in my stomach and feel so damn cold. A mile along the lakeshore cutting my way through the mist, the sound of the Windermere car ferry , creaking and groaning as it pulls itself along on metal chains. I am reminded of the ferry disaster of 1597. A wedding party 45 strong returning from Far Sawrey cram themselves onto the ferry which was in those days just a large rowing boat. The outward journey in calm waters, full of laughter and merriment turned to disaster on their return as the winds picked up the wedding party high on drink but low on balance capsized the boat and 38 people drowned. The biggest loss of life that this lake has seen. 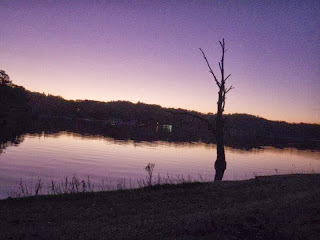 Since then people have reported seeing faces in these murky waters and swimmers have felt hands grabbing their ankles trying to drag them under to join the wedding party. These are probably just reflections and submerged weeds, but his morning through the mist the bouys that surround the islands look eerily like floating lifeless bodies . Onward and up ferry hill to the church at Far Sawrey the late flowering devils bit scabious scattered on the grassy road verges. Chattering crows gather on the wall watching me pass by like they’re waiting for something to happen. Through the Sawreys and along the side of Esthwaite Water this is always the coldest part of the ride in, this morning it is icy cold I look out across the water towards the Devils Gallop. In medieval times when Hawkshead was the main market town in south Lakeland the packhorse men would spur the horses on double-quick along this lonely stretch of road trying to keep one step ahead of old nick. Through the mists I hear the sound of hooves and a sudden snort of some large hidden beast on the other side of the hedge gets the adrenaline racing and I put my foot down on the pedals just that bit faster. Approaching Priests Pot, a small circular tarn on the edge of Hawkshead village past the site of the gibbet. This was an upright wooden post with a projecting arm for hanging the bodies of executed criminals. A bit like a giant bird feeder it acted as a blunt warning to the packhorse men approaching the village, with its 14 public houses, to behave themselves when they got paid or as a reminder as they were leaving that they may have got away with it this time but next time they might not be as lucky. Riding through the village the speed camera on the corner shouts 13 at me in bright red numbers ( why is it always 13 ) is it trying to tell me something ? 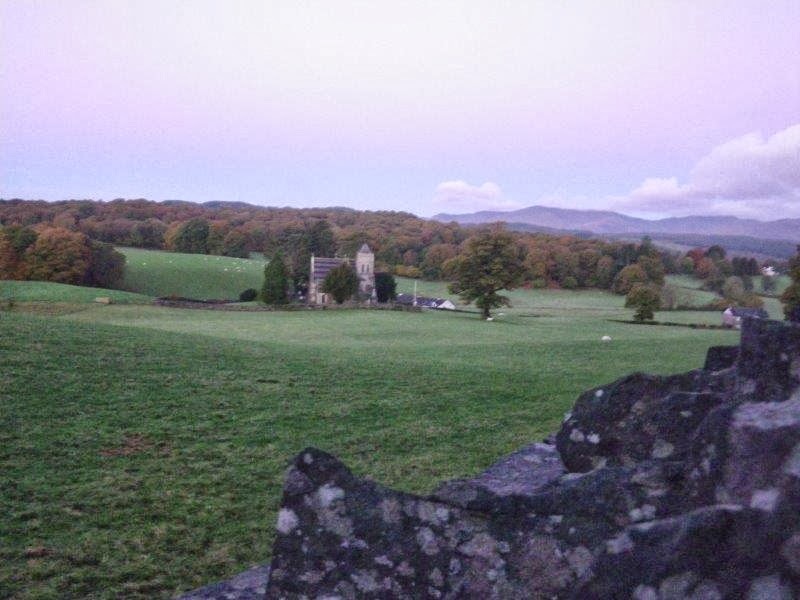 Riding out of the village my nerves on edge not warming up at all I look to my right to Latterbarrow and Claife Heights my thoughts inevitably stray to the Crier of Claife the ghost that has haunted the Heights since they were the property of Furness Abbey. There was apparently a house of ill repute on Claife heights where women would provide ‘ refreshment ‘ to the weary packhorse men. A young monk sent by the Abbey to save these women from a life of sin, fell in love with one of them, but his advances were spurned and the rejection eventually sent him mad, he died love lorn and lost on the heights. His restless spirit wandered the heights for years wailing into the night. One foggy winters evening the ferry men based at Ferry Nab, heard a desperate call from across the lake “ferryman, ferry man". The ferryman set off into the mist a single lamp on the prow of the boat lighting the way. After some considerable time, the boat eventually drifted back across the lake, with no passenger, no light and the ferryman wide eyed with terror, struck dumb by whatever unspeakable horror that he had witnessed . Well, that was enough for the locals and they quickly engaged two priests with ‘bell ,book and candle' to exorcise the ghost’s spirit to a remote quarry on the heights. If you listen carefully some nights you can still hear strange noises probably just the screech of an owl, the cry of a fox or the bark of young stag. 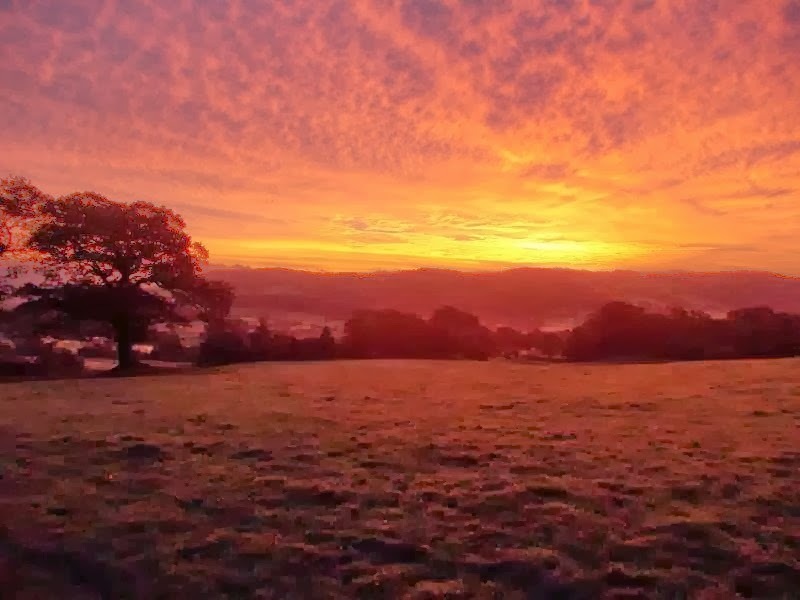 Climbing up Hawkshead Hill ,out of the mist now the ghost of the mad monk seems to be fading , but the late rising sun offers no heat and has cast a deep bloody hue over everything , the silent ghostly figure of a barn owl sweeps low across the field to my left. It is folklore that these owls carry the souls of the recently departed I look back to see Claife under a blood red sky, and it looks most peculiar. Up ahead I can see a black figure crouched over something in the middle of the road is that a shadow or .... As I get closer the figure stands up and breaks apart, exploding in ten different directions at the same time, the sound of a cape?..... no it’s the sound of wings flapping as a murder of carrion crows disperse into the trees above, not wanting to move too far from what was interesting them lying on the tarmac. What was interesting them is a mass of blood and bone and entrails , road kill of some description feeling bad enough I can’t bear to look too closely so I cycle on and the pain in my back and the cold are just getting worse. When you are walking the paths and lanes of South Lakeland if you feel a sudden unexplained rush of wind passing by or the squealing of brakes when no bike is around to be seen, it might just be me on my way into work again ........ghostrider. As rangers, the variety of places we work and the type of work we carry out varies a lot. It almost sounds cliched we say it so often. Whether that is rebuilding a dry stone wall, fixing a gate, filling in potholes, leading a guided walk, doing some 50 things activities with groups of children or presenting our special places to the highest standard (that includes the toilets!). 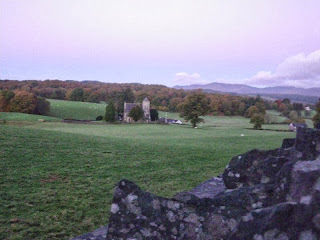 But the most important part of our role is sharing this love of special places with all our visitors. When I first started as a ranger, I was quite daunted by how much knowledge some of the other rangers had about their patch, ecology and the natural environment. From my volunteer days, I was under the impression that the role was very much about getting your hands dirty through the variety of conservation work such as rhododendron bashing and drainage clearance. But as it turned out it was about so much more than that! Every ranger brings their own special skills and interests to the job and the South Lakes ranger team is no exception. They have a wealth of knowledge and experience but historically we have not been great at sharing this knowledge around the team (great at sharing with the public!). After lots of ranger chitter-chatter, we came up with a solution - ‘Walking in the wild side’. The idea is for a ranger to run an afternoon session of his or her choosing on the South Lakes patch, once a month by getting out and in true Lou Reed style ‘walking in the wild’ side! The topics so far have ranged from dragonflies and damselflies, the landscape history and ancient trees of Tarn Hows, the history of the Coniston Coppermines and a historical walk around Blelham Tarn. It seems hard to see how we can justify the ranger time initially when we look at the mounting work such as fixing wall gaps, repairing fences, filling in potholes, strimming grass. Justification is easy – how can we share our love of special places with our visitors if we don’t spend the time learning about them? Many people tell me that you become knowledgable over time, by picking up tid-bits and simply asking lots of questions. I find the best way to learn is to get out and hear passionate people talking about the subjects that they care about! The idea is not only to share this knowledge but also to allow individuals to pursue their own interests and learn about a topic to share with everyone else. We have plenty more planned in for the future including meadow wildflowers, Beatrix Potter and her farming legacy, traditional use of woodlands and woodland crafts. I am hoping to run a ‘walk in the wild side ‘ by sharing (and improving!) my knowledge of Lake District geomorphology… The knowledge of the South Lakes ranger team as a whole is improving rapidly! One of the National Trusts’ aims is to pass on a richer, healthier natural environment for future generations. This starts with sharing our knowledge and interests with everyone we meet... We want to help people to recognise the true value of our countryside and have a role in caring for it, for example to understand the impact that wild camping and off-road driving can have on our special places. So if you see a ranger in red out and about, ask them what they have been learning about recently! It’s often striking how varied a National Trust ranger’s job can be. For proof of this you need look no further than some of the entries on this blog that cover subjects as diverse as working with volunteers on mountain paths (3rd October) to spending a few days in Manchester city centre (8th August), building storage compounds for tender boats on Windermere (25th July) to researching mysterious natural phenomena (27th June). A recent couple of days spent editing video footage highlighted this too. Back in May I filmed a great (if noisy) day working with Littledale Hall therapeutic community moving 20 tons of stone 400 metres uphill as part of the Claife Station project, but hadn’t had the chance since then to put it together into a short film. However, a few weeks ago I was given the chance to film the opening of the new ‘Peter Rabbit adventure’ rooms at Wray Castle. Being new it was much more important to get this film completed as quick as possible, so I set aside a few days to do so and at the same time managed to complete the Claife Station one. Very pleasing! Watching them back was what got me thinking not just about the variety of a ranger’s role, but of the amazing contrast between the different people the National Trust can be involved with. These two groups couldn’t have been less like each other; adults taking back control of their lives after struggling with substance abuse problems and primary school children excited to be entering the world of their Cbeebies heroes. Despite their differences it was brilliant to see how much they both got out of their days with us. Try as I might I can think of few organisations that can boast this broad a spread of appeal – makes you proud to be a ranger! If you fancy checking out both Claife station and Wray Castle then they’re handily at either end of a lovely lakeshore walk. To refer back to the blog again, the entry from 30th May has a description of this. Do bear in mind though that from 2nd November the castle is only open Friday, Saturday and Sunday. Perhaps you have unexpectedly seen a shed somewhere in the Lake District fells? This blog, from the South Lakes Upland Ranger team, explains why you might see one and outlines the story so far of one such shed. As an Upland Ranger team we spend much of the year up in the fells working on footpaths to protect them from erosion as part of Fix the Fells. This can mean working on the same path for several months in all weathers and some shelter and storage space comes in very handy. 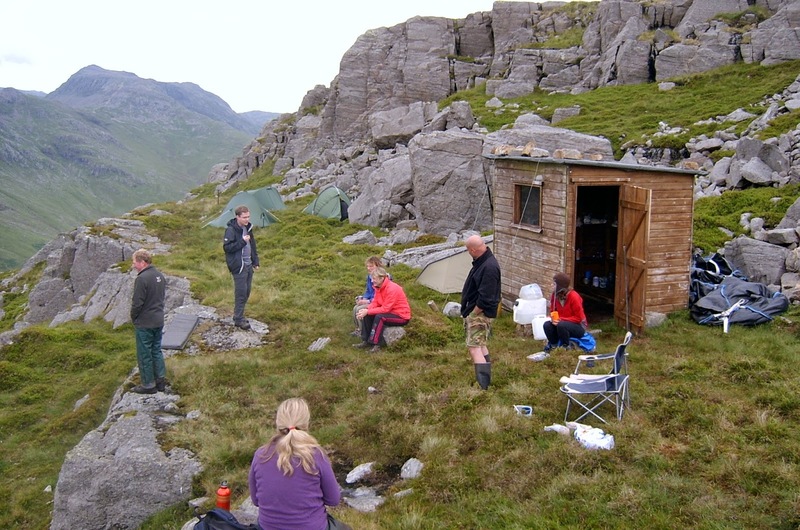 A shed has become the shelter of choice for this upland footpath team. This year we have had a shed on the Red Tarn to Crinkle Crags footpath, a joint project with the West Lakes Upland Ranger team. It is fair to say that this shed has been around the block a bit having been previously used in a few locations. It started out life lower down on this path and before returning has been to other locations including Pike o' Blisco and Crinkle Crags. The sheds we use are (usually) moved between sites by helicopter. The shed is flat packed and flown to location at the same time as rock for the year's projects is moved. This year it didn't go smoothly and due to weather conditions and priorities we didn't actually get a shed in place during the main helicopter lifts. However a few months into the project a helicopter was in the area for another job and we jumped at the chance to finally get it moved. Once the shed was in place the next job was to re-assemble it. There were some concerns that this shed had seen better days and may be partly rotten having spent three years on Crinkle Crags since its last use. We also had some fun trying to find suitable bolts and screws to fix it together and selecting the correct size nuts for the bolts! Finishing touches, tethering the shed down. Weather has taken a turn for the worse. We needn't have worried about the condition of the shed and it went together nicely. The weather was also kind to us and held out for almost all of the construction process. The shed was built in time for a three day party on this project with the Fix the Fells volunteer lengthsmen. It proved worthwhile too as we had some poor weather, consistent with our previous work parties. Some volunteers however seemed reluctant to use it as it would have been difficult to fit everyone in and instead sheltered in front of it. We have almost finished work for this year on the the Red Tarn to Crinkle Crags path and very soon it will be time to take the shed down and flat pack it. We have more work on this project next year and plan to construct it again next spring. Perhaps this shed will makes its home in a new location in 2016 or will it be time to retire it from active service..... ? This week the blog comes from the South Lakes Upland Ranger team. The first working day was a Sunday, the participants having arrived the day before and settled into the bunkhouse at High Wray. As an introduction to footpath work we took the group on a "drain run". This involves checking an existing footpath route emptying the drains and clearing loose stone from any "stone pitched" sections of path. The group, including one from Australia and one from Belgium, got stuck into this task and did a thorough job. Unfortunately it was quite a harsh introdution as the weather was not kind with wind and icy rain throughout the day. Although it was a good time to see how the drainage was working. After a grim first day we wondered if everyone would return on the Monday as very occasionally participants make an early exit. We needn't have worried as everyone was back bright and early to meet us at the Three Shires Stone on the Wrynose Pass. The group also brought with them much nicer weather. 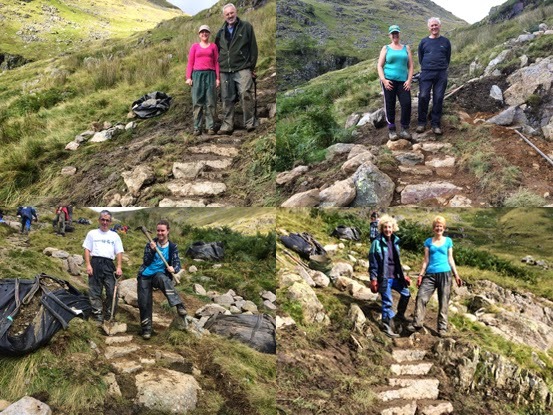 The work for the next two days was on one of the team's main projects for the year, the footpath from Red Tarn to Crinkle Crags. The group worked on a part where people were spreading out and a widening erosion scar was developing. The plan was to use landscaping techniques to remove any side routes and create a tighter more manageable path line. The landscaping approach used is sometime referred to as "hump & hollow". It involves stripping turf and re-shaping the ground next to the path into humps and hollows. The idea is to make this area unattractive to walk on so that people don't want to spread out. Once we are happy that the shapes of the humps and hollows are fairly natural looking the turf that was stripped off is re-laid. In addition grass seed (specially mixed for the fells) is used on any bare patches so the landscaping will green over and blend into the fellside. After a well earned rest day it was a time for a change of scenery and also a change of task. The location was the Tongue Gill path, part of the very popular Coast to Coast route. The work was to build a section of stone path using large rocks that had been lifted to site by helicopter. This type of stone stepped path is known as "stone pitching". The rock used has an interesting background as it came out of the ground lower down Tongue Gill during excavations for a hydroelectric power scheme completed this year. The owner of the scheme generously donated the rock to Fix the Fells . It was a very enjoyable and productive working holiday with lots of good quality work completed !